With the massive growth of social networks, brands are evolving into publishers due to the rise of the Internet as a consumer buying power house. Recently, only the biggest brands could play this game with corporate publications or magazines. Now company’s of all sizes can establish platforms for broadcast and conversation through Facebook and Twitter. As, in our previous post 5 ways curation and content automation increases engagement here we will go into depth on the next phase of how brands are becoming publishers. As brands scramble for attention, products like Strorify, Netvibes and Paper.li are all steadily gaining traction in enabling self publishing content curation. Social platform LinkedIn recently jumped on the bandwagon, blurring the lines between social media and the trending content from its users sharing, all in an attempt to keep you glued to their site. Not everyone has large budgets to invest in online PR, or a social media agency to manage content that is distributed through social media channels. Many brands realize the value of social marketing, and are creating, finding and sharing compelling content. This can prove to consumers that a company knows the market, and is a thought leader in its industry and wants to keep its customers engaged. According to a recent study, nearly half of US marketing professionals surveyed are now curating content as part of their strategy, and another 42% are familiar with the practice but not participating. Even among that group, 85% had done at least some content curation. If you ever pass around some interested content via email or shared a post, then you’re doing content curation. The main objectives of content curation survey were establishing thought leadership, and improving brand buzz. Brands with large numbers of followers have an absolute need to keep fans engaged. Yet most feeds are DEAD! Brands have a unique opportunity to own their content voice and be a thought leader in content that’s buzzing around them i.e. trending. If your content choice doesn’t touch a passion point with readers, you will lose social velocity and risk losing followers to a rival. The same goes for a brand’s social media presence. Content marketing can do much to improve results in SEO and customer acquisition. Inbound marketing solutions firm HubSpot has reported on the effectiveness of customer acquisition via blogging as well as how content created for social media efforts can boost search rankings. However, content curation can be made simple; its usually not a low-touch activity. The greatest challenges are creating content that is original and compelling, and finding the time to do so. Nearly half of marketers reported that finding and indentifying relevant content was difficult. Everyone knows the pain traditional publishers have seen over the past decade with the relentless internet growth, audience declining and just shutting down. Now you have converted a follower on Facebook/Twitter GREAT… So What! Customers have almost infinite choices. Keeping those follows, brands must keep creating value and feeding the information need, i.e. center of discovery. 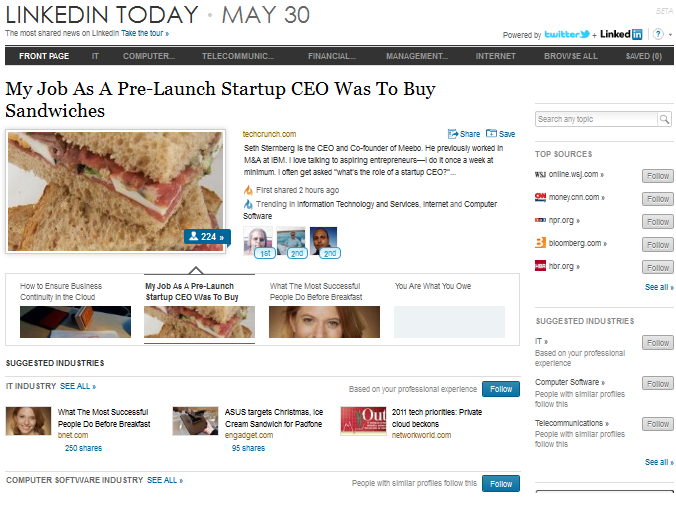 Your status updates, filling your customers news feeds. You better recognize that your role is one of publisher. The primary challenge is creating ongoing compelling content, while discovering and managing the deluge of information. The long-term trend for brands to become media is now very much a reality. Publishers and agencies must find their mojo in this fast growing space. Brands that listen and participate are able to make offering adjustments and therefore position with the communities’ involvement, while simultaneously attracting new followers due to the nature of how the feeds work. That is customer relationship management in action.